Barclaycard is probably the most well-known credit card in the UK, but is it still the best deal? 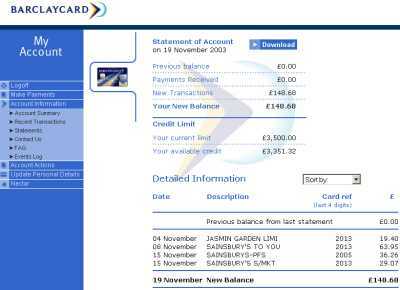 This page take a look at examines the Barclaycard in more detail. The Barclaycard Platinum card offers a range of benefits including good balance transfer offers, identity and fraud protection, purchase delivery protection, text message alerts, and some extra services for travellers. More details can be found at www.barclaycard.co.uk , or by calling 0870 154 0 154. In 2005, Barclaycard ceased to issue Nectar points on purchases. In our to a card that rewards its customers with cashback. Cut up your Barclaycard(s) and return them to Barclaycard with a brief covering letter. If you're cancelling due to Barclaycard's withdrawal from Nectar, make sure you mention this in your letter. When you ask to close a Barclaycard account, Barclaycard Customer Services should write to confirm account closure.